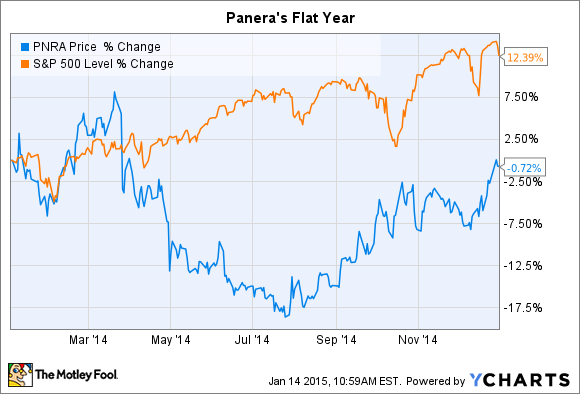 Why Panera Bread shares could rebound in the year ahead. Panera Bread (NASDAQ:PNRA.DL), the business, had a forgettable 2014 in which comparable store sales growth was flat while earnings and profitability both fell. The stock turned in a similarly weak performance: It ended the year exactly where it started and trailed the market by 12 percentage points. However, I see a few good reasons for investors to expect a better year ahead for Panera -- both the business and the stock. Comparable store sales growth for the most recent quarter was 2.1% at Panera's company-owned bakeries. Sure, that's below the gains that many successful restaurants are booking these days. Chipotle, for one, just managed its best comps figure, 20%, since going public in 2006. And Buffalo Wild Wings' comp growth was a hefty 6% in the third quarter. Still, despite that relative weakness there are two aspects of Panera's comp figure that suggest better days ahead for the business. First, it was the best overall result that the company has managed since the second quarter of 2013. And second, that 2.1% gain included a healthy 1.4% uptick in customer traffic. That's also the best result that Panera has seen in that metric in years -- since the first quarter of 2012, to be exact. With customers apparently willing to give its cafes a second chance, Panera's biggest challenge could be how it handles any growth in demand. Remember, its struggles really started in mid 2013 when a too-complicated menu clogged up the kitchen, increased customer wait times, and led to heaps of lost revenue. That's where the company's new operational improvements should pay off in 2015. Panera recently started rolling out a number of strategic changes, including kitchen upgrades, which are all aimed at improving order throughput and accuracy. Yes, the company had to sacrifice profits over the last few quarters to pay for these changes. But the result should be higher sales and a much better guest experience in 2015. Once comparable-store sales growth recovers and customer satisfaction levels are headed higher again, then management can consider profit-boosting moves like menu price increases. Food costs on ingredients like butter and dairy are rising right now, and Panera has had to eat most of that increase on account of the soft operating environment. The company's food costs rose to over 30% of sales last quarter. But Panera will be free to pass along more of those costs once the operating environment recovers. And that means profit growth should eventually rebound from the flat result that investors saw in 2014. That's not a far-fetched scenario, either. In 2012 Chipotle had to sit through many quarters of declining profitability as its comps growth trended lower. It wasn't until the next year, when comparable-store gains had bounced back, that the burrito slinger began raising its menu prices in line with costs. And with both metrics headed firmly higher now, Chipotle investors were rewarded for their patience most recently with a 56% gain in quarterly profit. I'm not looking for Panera to book the same level of profit improvement any time soon. But, if the company can handle its operational challenges and keep diners happily moving through the cafe line, then investors can expect strong earnings gains to follow any consistent upturn in customer traffic.